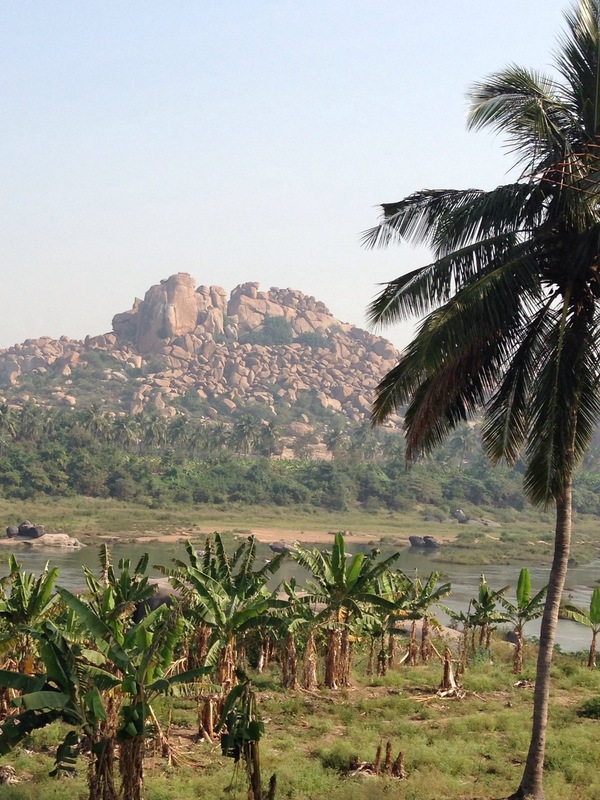 As we approached Hampi we were greeted by an incredible landscape. Paddy fields and banana plantations interspersed with surreal giant boulders sitting on top of each other at improbable angles (I still have no idea how they came to be here and need to pick my Geologist Uncle’s brain). 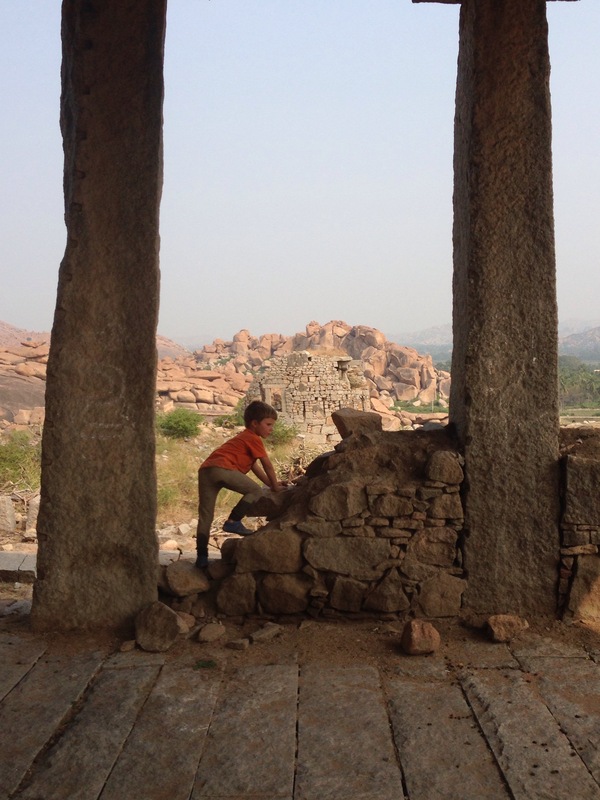 We’d heard a lot of positive things about Hampi but spent the first day feeling somewhat underwhelmed. Hampi Bazar is the kind of traveller enclave that offers respite from the onslaught of Mother India. However after a month of easy living on the beaches of South Goa we were over the same same but different chill-out vibe. We had breakfast at the rooftop restaurant of our guest house and loved seeing all the beautiful birds including parakeets and kingfishers as we looked out on the river. We had a wander round the nearby sites on our first day, giving us time to recover from the sleeper bus journey. We visited the Virupaksha Temple. 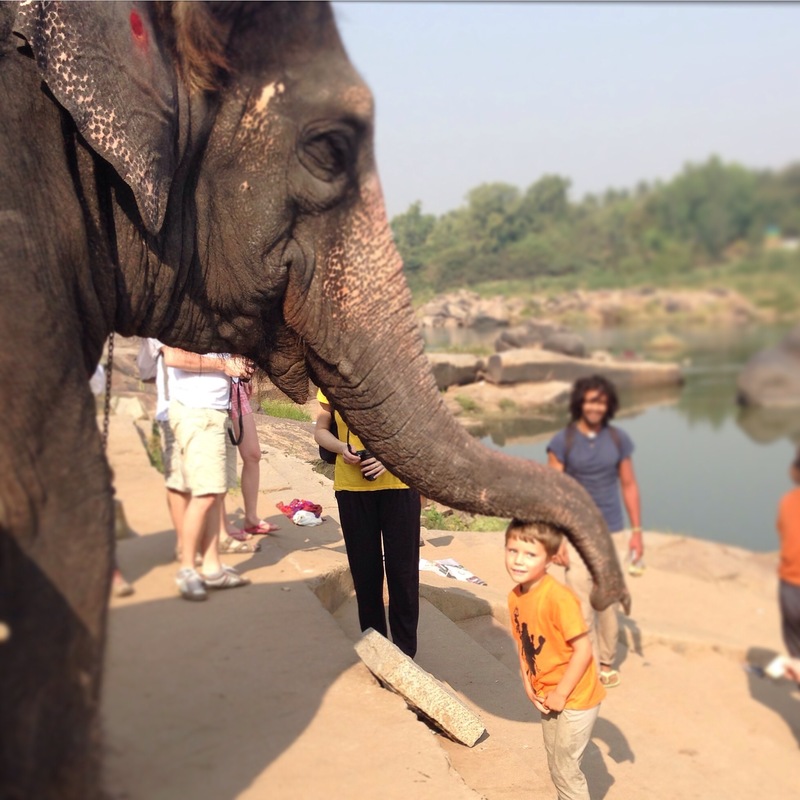 With its troop of resident monkeys and Lakshmi the temple elephant this was lots of fun for the children. 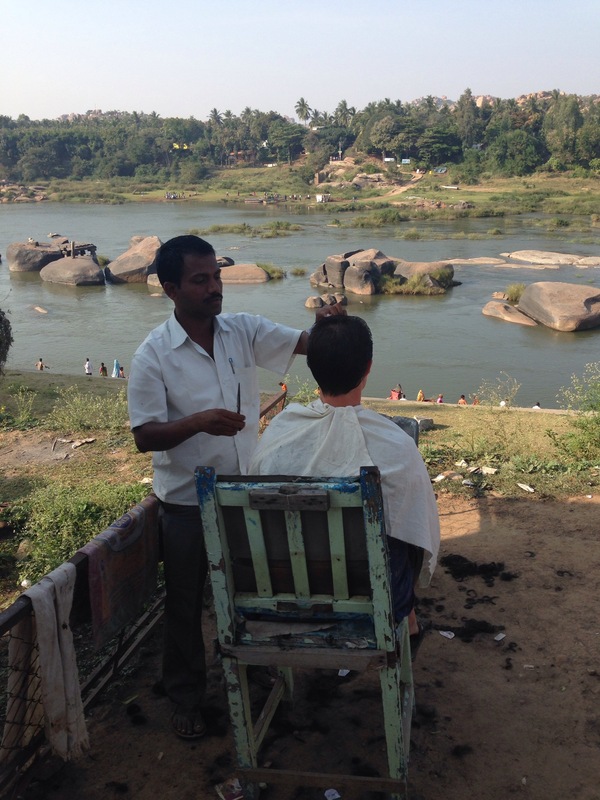 In the afternoon I had a spontaneous haircut looking out over the Tungabhadra river. It may not be the best style but it is definitely the best view I’ve ever had during a haircut. The next morning George and I wandered down to the ghats to catch Lakshmi the elephant have her morning bath. We were told she would be there about 8.30 but in fact arrived nearer 10. It was worth the wait. She seemed to really enjoy her bath and George loved feeding her bananas and having a smooch (blessing). I really enjoyed the one to one time with my boy as we shared bananas and chai and watched the world go by. 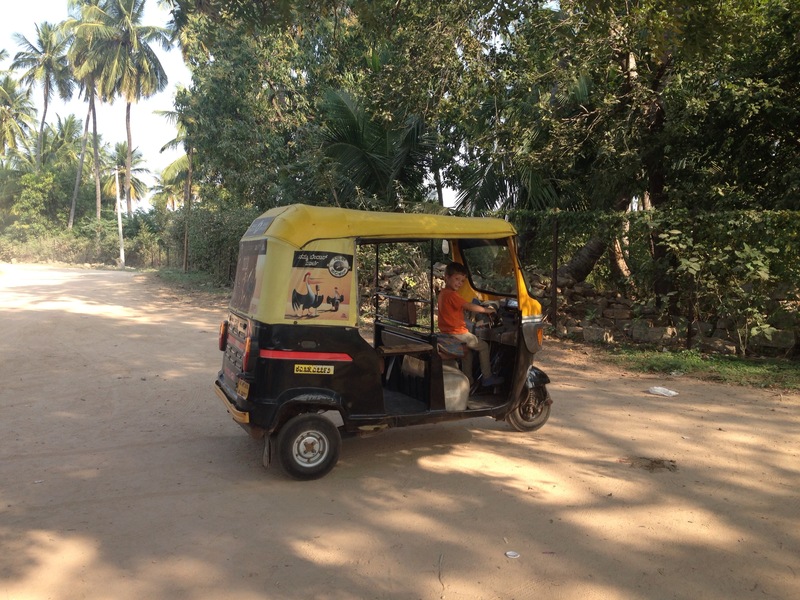 We spent the rest of the afternoon touring the ruins in an Auto Rickshaw. 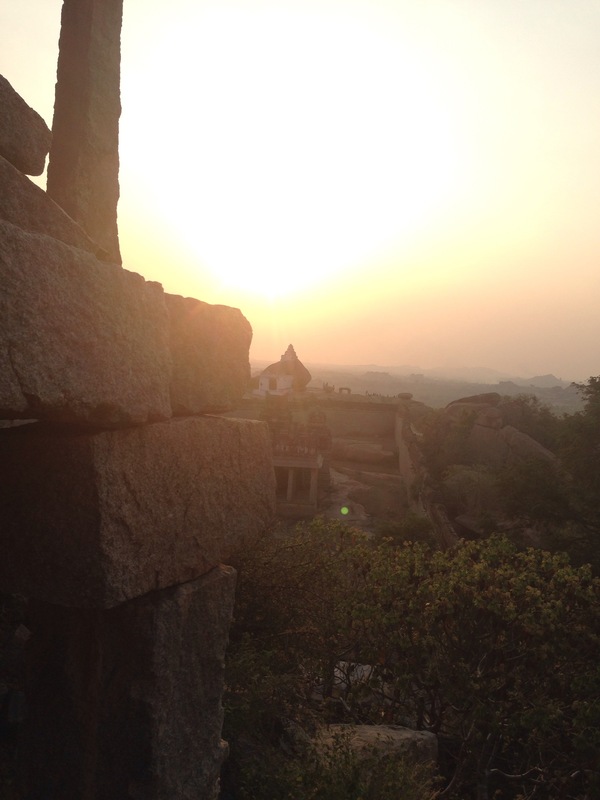 This is when I fell in love with Hampi. Trying to imagine life in its hey day when it was a bustling commerce hub and home to 500,000 people. The boys had fun running around playing hide and seek and being explorers. George got a driving lesson from Sadiq our tuktuk driver. The sites in Hampi are spread over 36 square kilometers so it is easy to explore in relative solitude, unusual for India where tourist attractions are often overwhelming with the number of people. The grand elephant stables were a highlight for the boys. 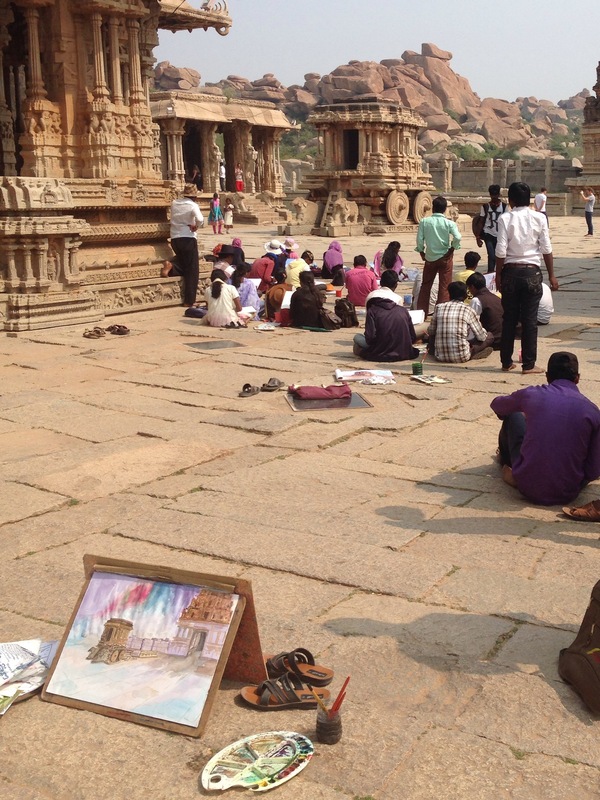 We stumbled on an art class at the Vittala Temple, it was really lovely to see all of their watercolour paintings of the impressive stone chariot. We had fun over the river in Anegundi. 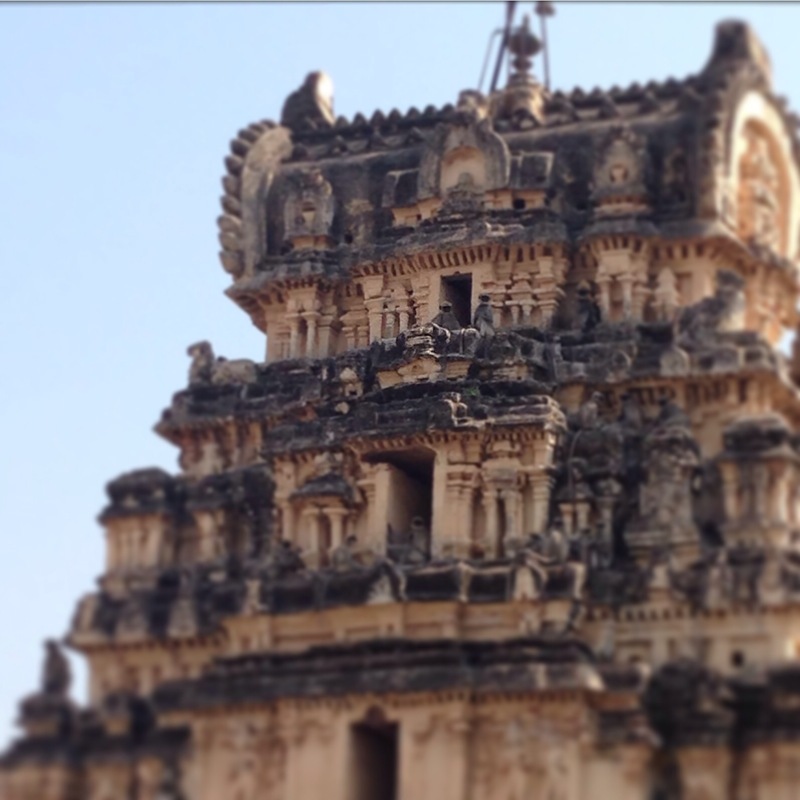 It shares the remarkable landscape and ruins of Hampi but remains a sleepy village. The boat across the river squeezes on motorbikes with the passengers and one wonders how it can possibly stay afloat. We had a fab thali and the boys played with the cafe owner’s daughter. After lunch we explored the ruins of army barracks and elephant stables. I enjoyed seeing the contrast between these stables and the ornate ones across the river that housed the royal elephants and the boys enjoyed chasing lizards. It was great fun to be the only people around, scrambling over boulders, humming the Indiana Jones theme tune as we went. A couple of local boys tried to sell us baby birds but we declined, it wouldn’t be a very jolly life for them in our backpack! The streets of Hampi Bazar are car free. There are rickshaws and the odd motorbike but the kids could play and make friends without us worrying they were going to get run over. I’m happy to say that after a couple of days exploring the ruins we really enjoyed our time in Hampi. And would definitely recommend it as a great place to go with children. Definitely a future destination for us. We want to be Hampi too :). Yes, great view whilst getting your hair cut – priceless! !